Daily Debate: Is The Triforce Better Off Being Destroyed? One of the most recognizable symbols in video games, the Triforce represents both the Zelda series as a whole and its most powerful relic. As a creation of the Golden Goddesses, the Triforce has the ability to grant the innermost desires of the one who lays hands on it. For this reason, it is kept sealed away in sacred places like the Temple of Light (Ocarina of Time) in the games it physically appears in. Depending on the game this isn’t its only power, however. A Link Between Worlds also shows that the kingdom of Lorule once had a Triforce and that the loss of it has caused their world to slowly die. As a creation of the Golden Goddesses, the Triforce crests each represent a facet of them. The top crest represents power, while the bottom-left represents wisdom, and the bottom-right courage. A caveat of its wish-granting properties is that if one who does not have an equal balance of these three qualities in their hearts when making their wish, it will fragment into its three pieces, with only the crest most representing the person who made their wish remaining with them. This is what happens with Ganondorf in Ocarina of Time when he successfully obtains the Triforce after tricking Zelda and Link. 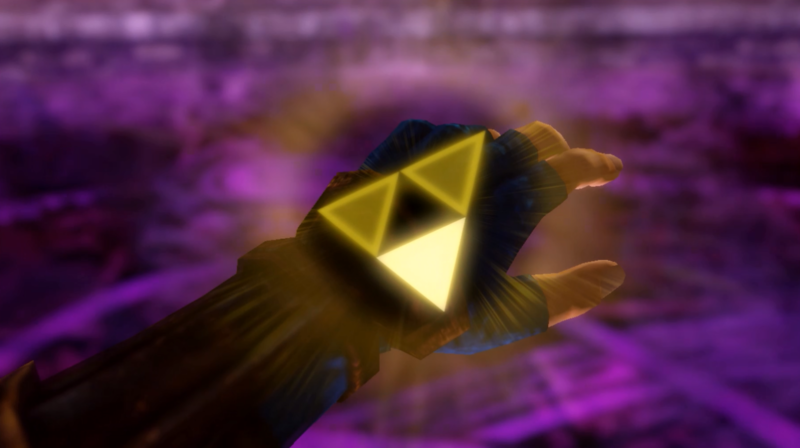 This fragmentation leads to Zelda obtaining the Triforce of Wisdom and Link the Triforce of Courage, while Ganondorf retains the Triforce of Power in successive games. From then on out, it becomes many people’s goals to reunite the separated pieces with varying degrees of success. Because of this, as well as Demise the Demon King and Vaati’s original attempts at utilizing the Sacred Triangles, the land of Hyrule has been plagued with disaster and destruction. However, it has also been used for great good, such as when Link and Zelda used the Triforce to wish Lorule’s Triforce back into existence, therefore saving their land from eternal chaos. Since world’s like Termina and New Hyrule can exist without the Triforce, this begs the question: Assuming one could do away with Hyrule’s Triforce without the land ending up like Lorule, is the Triforce better off being destroyed? Let us know what you think!